We’ve never come under attack by liberal Muslims, but conservative Christians have drawn plenty of blood. 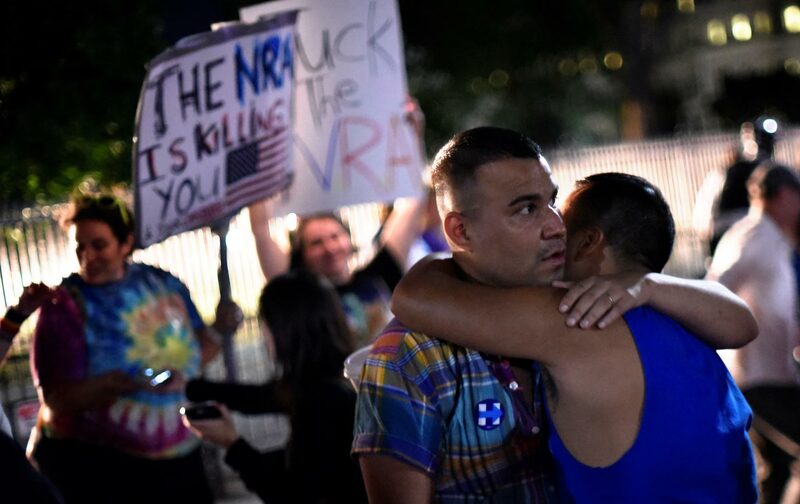 In the wake of the bloodshed in Orlando, some conservatives are making the particularly vile claim that the left “chose Islam over gays,” as Breitbart put it, and therefore is somehow to blame for the loss of 49 lives on Saturday night. This sort of rhetorical jab is why, in the hours after any mass shooting or domestic terror attack, many of us secretly hope that the perpetrator will turn out to be a Christian right-wing extremist rather than a Muslim like Omar Mateen. It makes no difference whatsoever to the victims or their relatives, but we dread the inevitable outpouring of bigotry against all Muslims that follows if the shooter is Muslim, and understand that violence by Christian or Jewish or Hindu (or whatever) extremists isn’t counted against those communities in the same way. Nobody ever feels the need to ask whether their local preacher condemns violence in the name of Christianity. It’s just assumed. The details differ, but the defining characteristic of all right-wing religionists is an abiding contempt for religious pluralism. They deny the legitimacy of other faiths. All conservative religious traditions are hostile toward gays and lesbians and those who reject traditional gender roles. Most embrace religious nationalism and reject multiculturalism. There are some exceptions, but most oppose abortion. They all want to return to an idealized vision of an earlier, simpler time. When you get down to brass tacks, they’re all right-wingers. Thankfully, the vast majority of conservative religionists aren’t violent. That’s as true of Islamists as any other group. Writing in The Guardian, the Pakistani scholar and author Ali Eteraz argues, “It is a great fallacy to think that jihadists and Islamists are one and the same.” But, he writes, the Muslim right is an “ideological movement” that’s grounded in an inherently conservative “individualist revolution” within the Islamic world. With their religious supremacism—which convinces them that everyone else’s life would be better off if they adopted the same values as them—these Muslims leave themselves wide open to be preyed upon by savvy propagandists. Thus, hateful tricks like invoking the dangers of homosexuality, attacking sexual liberation, demonising religious minorities and foreign cultures, and censoring anything that smacks of critical thinking, are all used to keep the ideological base stirring. That sounds a lot like Ted Cruz’s base. Academic studies show that organized religious terrorism isn’t really about religion. Groups like Al Qaeda and ISIS have decidedly secular goals—political power or control of territory or resources—and use religion as a potent recruiting tool. It gives their followers a sense of shared identity, defines their enemy, and steels them to commit unnatural acts of violence. It’s the same with Christian terrorist groups like The Lord’s Resistance Army in central Africa and India’s National Liberation Front of Tripura. It’s the same with violence by extremist settlers in the Occupied Territories. Their leaders may claim to speak for their God, but their objectives are always earthly, not theological. Their leaders may claim to speak for their God, but their objectives are always earthly, not theological. That belief system contrasts markedly with liberal religionists of all stripes. They attend interfaith conferences. They’re constantly calling for dialogue and understanding between different faiths and stressing the universal values all of the world’s major religions hold in common. At the extremes, religious leftists may drop out and join hippie cults or get arrested trying to rid the world of nuclear weapons, but they don’t blow people up or go on shooting sprees. A “lone wolf” may be suffering from mental illness, as Mateen may have been, but the same conservative religious ideology is motivating him. We know that Omar Mateen at least flirted with ISIS. The FBI had interviewed him repeatedly. He reportedly scouted Disney World as a potential target. But we also know that a co-worker described him as a belligerent racist, and his father told NBC that he had become enraged by the sight of two men kissing. There are also reports that he was a regular at Pulse, and cased other gay nightclubs before the attack. So far, there’s no evidence that he was actually guided by any organized terrorist organization. Eric Rudolph must have been similarly enraged when he bombed a lesbian nightclub in Atlanta. Yishai Schlissel, the ultra-Orthodox Jew who stabbed three people at the 2005 Jerusalem Gay Pride parade, went to prison, and then stabbed six more at the 2013 parade—one fatally—probably felt the same revulsion. In ISIS-controlled areas, homosexuality is punishable by death. Right-wing Christian extremists from the United States played a key role in promoting a Ugandan law that would have imposed the death penalty for gays and lesbians (after international outcry, the death penalty was replaced with life in prison in the final version of the bill). In rejecting anti-Muslim bigotry, we don’t “choose Islam” over anyone. The reality is that we reject the religious supremacy, hostility toward LGBT people, and insistence on traditional gender norms that’s embraced by virtually all conservative people of faith, whether they express it with violence or discrimination or strange laws governing where people pee. So whether it’s Robert Dear shooting up a Planned Parenthood clinic or Baruch Goldstein massacring Muslims at prayer or a guy named Omar going on a killing spree in a gay nightclub in Orlando, it’s all religiously inspired right-wing terrorism. Let’s stop worrying about which holy text some killer cherry-picked to justify his crimes and call it what it is.